A lot of recent discussion has surrounded a possible wave of development around Hamilton's long-neglected West Harbour lands stretching from the base of Dundurn Castle over to the eastern edge of Pier 8 overlooking the HMCS Haida. Whenever waterfront development comes up, we inevitably hear the refrain, "Let's make sure we don't ruin our waterfront and make it like Toronto's." Of course, the Gardiner Expressway and Great Wall of Condos completely blocking the city from the water is a giant mistake that should not be repeated in Hamilton. But at ground level, Toronto's waterfront has done a couple of tremendous things that I'd like to see way more of here. They've actually been busy building, not just talking, planning and then planning some more like we are famous for in Hamilton. Their waterfront has changed dramatically over the past five-to-ten years while we continue talking about ours. They've put tremendous attention to detail and to providing a myriad of fun places to go on the waterfront. It's not just one giant park with a walking path. Hamiltonians can rest easy that Toronto's mistakes won't happen here, in large because we did one thing absolutely right - we developed the public green space first. This means places like Bayfront Park, Pier 4 Park and Pier 8 Park will remain as public green space forever. Toronto residents would kill to have these fabulous waterfront parks along their shoreline. But Hamilton needs to start planning for more than just blocks of condos with a walking path around the perimeter. There are many elements of Toronto's waterfront that I would love to see us replicate here, both at Pier 8 and in the Barton/Tiffany lands. Our family spent a couple hours at HTO Park on Queen's Quay recently. The kids loved the small sandy beach area with umbrellas bolted down into the pier. It was busy with residents tanning, reading, napping and enjoying life on the water. Speaking of cobblestone, it is very easy to see the long-term vision for Toronto's waterfront slowly being pieced together with each new project. The bike lanes along Queen's Quay are what Hamilton should be building across our unnecessary, mega-wide streets all over the city. They are protected from traffic and make highly visible use of paint where needed to clearly mark the lanes. Hamilton's paint-phobia needs to end ASAP. Hamilton has a rich industrial heritage, yet it seems as though we rarely celebrate it with the use of cobblestone when revitalizing old neighbourhood streets or waterfront districts. Black asphalt seems to be our go-to. We should make cobblestone a priority all through the Barton/Tiffany lands, as well as Pier 8. The Distillery District is another fine example of reminding everyone of the industrial past by using appropriate materials. Imagine if this was all black asphalt? Sugar Beach further east along the Toronto Waterfront shows the consistency in design being used throughout this waterfront district. Trees, promenandes, cobblestone, ample seating and again, more fun destinations for the entire family. Unique, fun urban spaces need to become a priority in Hamilton. Think interactive water-jet fountains, sandy beaches with Muskoka chairs, and artsy splash pad parks with a dramatic canoe. Hamilton should incorporate these various types of elements when planning not only our waterfront lands, but any lands city-wide. Imagine a large play structure overlooking the harbour from Bayview Park, or a cobblestone promenade along the Caroline Street North pedestrian piazza planned in Barton-Tiffany. A Queen's Quay-style design with cobblestone and separated bike-lanes along Barton Street, Stuart Street, Caroline Street, Strachan Street and Queen Street in the Barton-Tiffany district. 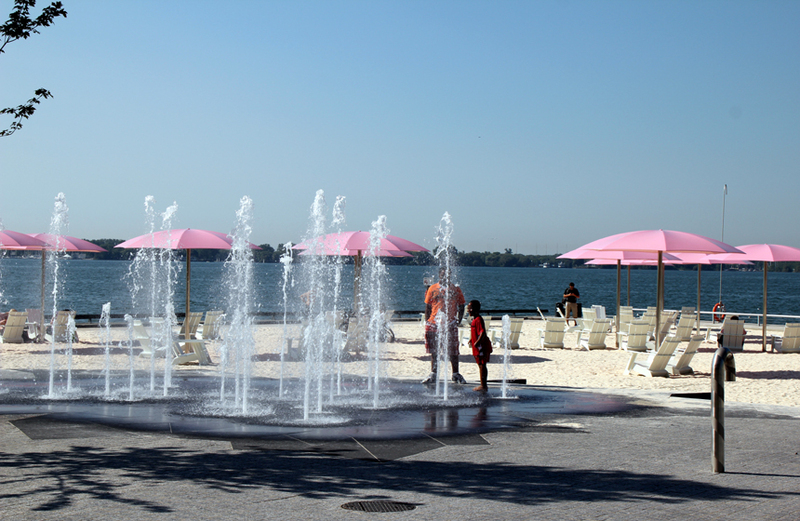 A Sugar Beach with splash pad jets, chairs, umbrellas and large sandy beach as the focal point at the north/central area of Pier 8 with a tree-lined cobblestone promenade leading around the waters edge, and also from the south, cutting right through the newly developed pier. The possibilities for these prime pieces of land are endless. We only have one shot to get it right, and we must get it right. Empty lawns and black asphalt won't cut it. The development along these two prime pieces of downtown waterfront land must match the best waterfronts in the world. I should have mentioned this in the piece, but one common feature that I loved along the waters edge throughout the waterfront was the lower level composite 'wood' deck walkway right against the water. The large step down from the concrete/cobbled promenades provides an endless seating wall. On the higher concrete level there were also many extremely long concrete slab benches. The 4th Toronto pic illustrates these long benches very clearly. These two elements not only separate the sandy beach areas, and cobbled promenades from the lower level (which means views of the water aren't blocked while lounging on one of these beaches), but they provide literally constant seating. We've been at Pier 8 before and lamented at the very few wooden benches that are always filled leaving no place to sit and enjoy the water. We took my wifes' father to Pier 8 on Fathers Day for ice cream and had to stand the entire time. He's in his 80's. He loved the view, but I'm sure won't want to go back knowing there is no place to sit. In Toronto, the benches along Queens Quay were also extremely long and wide allowing for many people to sit on either side at a time. Lots of small details add up to a great experience. Hamilton would be wise to learn these same lessons. Sorry for the double post, but I wanted to add a couple of pics that didn't make the original cut. Simply, they are of water jet play fountains. Toronto has them all over. Hamilton should too. Kids and adults alike LOVE them. Hamilton's waterfront can be such a jewel to be admired if the City can get on one page to see a place of relaxation and entertainment at the same time. Yes cobblestones are essential for telling the history along with proper seating that does not fill up with the first 10 people. Toronto has indeed blocked off the access to the lake but at least when you get there there are places to sit, eat and play. "We should make cobblestone a priority all through the Barton/Tiffany lands, as well as Pier 8." When was the last time you had to ride your bike over cobblestones? There are very good reasons why they are little used. Be careful what you wish for. You may be cursed by getting it. I see no reason for the Barton/Tiffany and Pier 8 bike paths to look very similar to Queens Quay. Having cobblestone everywhere else keeps bikes slower and safer for mixing with wandering kids, pedestrians etc..... the wide promenades along the TO waterfront have a smoother cobblestone than Distillery. In densely mixed areas, I have no problem at all with cobblestone slowing everyone down. Off road smooth bike paths can nicely co-exist with cobblestone promenades and pedestrian-first zones as we sees all through Europe and now on Toronto's waterfront. Hmmm... I suspect that what you are calling cobblestone is actually a brick surface. Which is better than cobblestone, but brick or concrete tile has been phased out of use as a cycling surface in The Netherlands because asphalt is generally better. Although if you really want a brick surface, I note that a type of brick has been developed that is suitable for cycling. "...safer for mixing with wandering kids, pedestrians etc....."
One of the reasons that Toronto has a forest of Condo's on its waterfront was that when the land was given to Toronto by the federal government back in the 1970's, no money was given by them to clean up the and develop the land. Therefore the Harbor Commission had to sell pieces of land to developers to pay for the first parks and their environmental clean up. In Hamilton's case a money should be set aside ahead of time to allow for these possibilities. Your view is your view and that may not what the neighbourhood wants per se. The neighbourhood gets to give very little input into development issues. Only those with deep pockets get their way. We're not talking about an expensive taxpayer-funded Queens Quay megaproject thing. Just some fancying of 500 meters of pier edge. And maybe something tiny like a 50 foot triangle-shaped corner beach is all we really need -- something similar to Toronto's Sugar Beach. Our steelworks view will be a kind of a parallel to that Toronto no-swim beach's RedPath Factory view. This sort of small fancy thing may be privately fundable, or paid for by the developer of the area. A small beach corner may be even be able to be community-funded or developer-funded like certain kids playground were funded -- it is essentially just a very large sandbox with parasols and muskoka chairs. Families and kids love that! Something reasonable. The point about Toronto is not an opinion, its fact. Keep in mind there was no neighborhood there back then in the early 1970's, when the Federal Government had a big election announcement and The City of Toronto (Through the Harbor Commission) would get all the land from the industrial harbor and former ship yards between the ferry docks and the island airport. The land parcels and the soil was extremely toxic and had to have all its soil go through environmental cleanup and remediation. The federal government didn't give any funds for this extremely expensive endeavor. The Harbor Commission had no option but to sell parcels of clean land to pay for the soil cleanup. The cost of the soil remediation went up like everything else in the 70's and therefore more land had to be sold. The main problem is once you establish a pattern, and you have no land use plan because the Harbor Commission didn't feel it needed one, developers can argue you can't stop giving me permission to build when you have allowed someone else the same right, by your actions you have established a precedent. I like nature and swimmable beaches, but this is a good idea. The Toronto "Sugar Beach" concept of a "no-swimming beach in front of a factory" (that beach in front of Toronto's RedPath sugar factory) would work well as we expand the recreational waterfront eastwards closer to the old U.S. steel lands where the water is not currently desirable to swim in. Sitting with a lake view, feet in beach sand, sitting in Muskoka chair under parasol. Turn your head left, you see fancy revitalizations (including Sarcoa) 500 meters west. Turn your head right, you see Hamilton's classic steelworks about 2-3km away east. Turn your head even further right, you see HMCS Haida behind you. A nice dividing line between pretty recreational Hamilton and the industrial Hamilton. Around there, the water isn't really swimmable at this time anyway, so a 'no-swim beach' boardwalk in general area location would work very well. It provides a very different vantage point of Hamilton that feels different from existing beaches. A small patio pub can be installed behind the beach to give ambience & concession variety to the area. It would also increase tourism and revenue for a fancied-up Haida site, along with all the new residences, businesses and establishments that is planned to be built. The beach would not take up much space, as Sugar Beach is really small. It could be a strip or it could be a pier-corner triangle like Sugar Beach (at the north-east corner, the corner east of Sarcoa). It would not take land away from development, and actually improve ambience in an otherwise industrial-area.